Since 1977, a strong heritage for excellence and integrity has been the hallmark of AV-rated Hammerman & Hultgren, P.C. Our firm has emerged as Arizona’s premier creditor and collection law firm, in the eyes of both the local and national legal communities. We are confident that the premium services delivered by our legal staff will exceed your expectations. Our lawyers and paralegals consistently provide the highest caliber of legal services to the creditor community in an increasingly specialized field. We resolve commercial claims through negotiation or litigate through trial and, if necessary, on appeal. Our practice allows us to routinely handle consumer claims individually or in bulk. Insurance losses can arise from a defective product, negligence, or a breach of contract. Stan Hammerman will be presenting a live webinar for Lorman Education on Collection Techniques and Law. For more information, visit Lorman’s website at http://www.lorman.com/405422?discount_code=C9828567&p=13389. For more information, please see News section. HAPPY NEW YEAR FROM THE H&H STAFF! Hammerman & Hultgren, P.C. is proud to be included in the U.S. News & World Report and Best Lawyers Ninth Edition of the “Best Law Firms” rankings. Congratulations to both Stan Hammerman and Jon Hultgren who were selected for inclusion in the 2018 Southwest Super Lawyers publication. Congratulations to Tina Ziegler who was the recipient of the 2017 NALS of Phoenix Award of Excellence. Congratulations to both Stan Hammerman and Jon Hultgren who were selected for inclusion in the 2017 Southwest Super Lawyers publication. Hammerman & Hultgren, P.C. is celebrated its 40-year anniversary in 2017! Congratulations to Tina Ziegler who was elected to the Maricopa County Bar Association’s Board of Directors for the 2017-18 term. She is one of the first non-attorneys to be elected to a Director position. Congratulations to Stan Hammerman who was included in the 23rd Edition of The Best Lawyers in America for his work in Commercial Litigation. Congratulations to Tina Ziegler who was named as the Maricopa County Bar Association’s 2016 Robert R. Mills Member of the Year. Congratulations to both Stan Hammerman and Jon Hultgren who were selected for inclusion in the 2016 Southwest Super Lawyers publication. Click here to see the electronic version of the publication. Congratulations to Jon Hultgren who was selected to be included in the 2016 Best Lawyers in Arizona and New Mexico for his work in the practice area of Insurance Law. Congratulations to Stan Hammerman who was selected to be included in the 2016 Best Lawyers in Arizona and New Mexico for his work in the practice area of Commercial Litigation. Hammerman & Hultgren, P.C. has been selected for the 2015 American Leadership Award amongst all its peers and competitors by the American Economic Institute (AEI). Congratulations to Stan Hammerman who was selected to be included in the 22nd edition of The Best Lawyers in America for his work in the practice area of Commercial Litigation. Congratulations to Annette Fuentez who has been promoted to the position of Customer Service Department Supervisor. Hammerman & Hultgren, P.C. has been selected for the 2015 Arizona Excellence Award amongst all its peers and competitors by the US Commerce & Trade Research Institute (USCTRI). Congratulations to Tina Ziegler who obtained her Advanced Paralegal Certification in the area of Discovery in June 2015. Congratulations to Ruth Crosby who was promoted to the position of Director of Operations. Congratulations to both Stan Hammerman and Jon Hultgren who were selected for inclusion in the 2015 Southwest Super Lawyers publication. Congratulations to Tina Ziegler who became the President of the Maricopa County Bar Association’s Paralegal Division in April 2015. She will serve in this capacity through the end of 2016. Stephanie A. Webb, an experienced bankruptcy attorney, joined the firm as an Associate Attorney in March 2015. Congratulations to Tina Ziegler who passed the Certified Paralegal Exam on March 1, 2015. Hammerman & Hultgren, P.C. was ranked as the No. 2 Creditor’s Rights, Collections Law Firm in Ranking Arizona’s The Best of Arizona Business publication for 2015. Congratulations to Stan Hammerman who was included in the Best Lawyers of 2015 for Arizona and New Mexico in the area of Commercial Litigation. Congratulations to Tina Ziegler who was appointed as the President-elect of the Maricopa County Bar Association’s Paralegal Division for 2015. Her presidency will begin in January of 2016. Stan Hammerman had an article entitled “OMG! A Counterclaim’s Been Filed” included in the March/April 2014 edition of the IACC’s Scope publication. Congratulations to both Stan Hammerman and Jon Hultgren who were selected for inclusion in the 2014 Southwest Super Lawyers publication. Click here to see the electronic version of the publication. 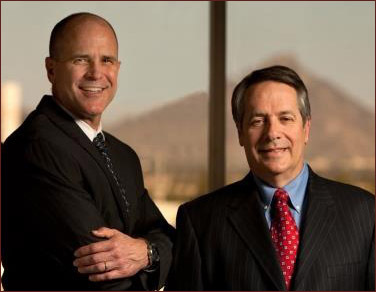 Both Stan Hammerman and Jon Hultgren were included as Arizona’s Top Rated Lawyers in 2013. Click here to see their information. Congratulations to Stan Hammerman who is celebrating his 15 year anniversary as a Martindale-Hubbell® AV Preeminent rated attorney.